Dave Buchanan says the Cobblers players have ‘to stand up and take responsibility’ to steer the Cobblers away from the relegation zone. Town have failed to win any of their past six matches, losing five of those fixtures, and last Saturday they were humbled by a 5-1 thrashing at Oldham Athletic, a team with relegation fears of their own. It’s a run that has left the Cobblers second-from-bottom in Sky Bet League One, with only Bury below them, and facing the grim realisation they are in a dogfight to secure their safety this season. Reflecting on the loss at Boundary Park, Buchanan said: “I think everything went wrong that could have done. “We found ourselves down after three minutes which is definitely not the ideal start, and then it just got worse from there. “It is so frustrating, but it is not the first time it has happened and as players we have to stand up and take responsibility. Town are back on home soil this Saturday when they host mid-table Walsall, and Buchanan added: “We have to find that form that we had when we got that late draw at Rochdale, we went on a run of six unbeaten, and that is what we have to focus on. “It all starts this week, we have two massive home games coming up and we have to remain positive, as hard as that is. The current run is the third lengthy one without a win in a season that has seen the Cobblers win just five of the 28 fixtures they have played in all competitions. 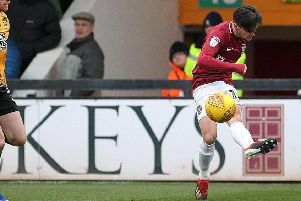 The campaign started with a five-match losing streak that cost Justin Edinburgh his job, before the team went another nine matches without a win in September and October, a spell that included a 6-0 home hammering against Bristol Rovers. And Buchanan knows that is not good enough. “The form is worrying, because let’s have it right, this is not the first time this has happened this season,” said the 31-year-old, who has made 25 appearances this season. “We got beat 6-0 at home by Bristol Rovers, and it was 5-1 the other day, but we have to be positive. “At the minute the players are not doing as much as they can do, and are not really giving the fans anything to shout about.